The 2011 animated film, Rio, revolved around the fortunes of two main characters that were essentially anthropomorphized versions of the birds, Cyanopsitta spixii, the blue or Spix’s macaw. This movie had a happy ending for them in their native land of Brazil. Now, however, it appears that the real-life birds on which 'Blu' and 'Jewel' were based are experiencing trouble similar to that portrayed in their story. The macaw's position on the "Red List" maintained by an international ecological body has been updated - and not for the better. The Red List is a tool used by the International Union for the Conservation of Nature (IUCN) to indicate the risk of extinction in many known animal species in the wild. A species’ ranking on the list is determined by recorded observations of its members in their natural habitat. This may, in turn, give an indication of the current population of that particular species, breeding partners and genetic diversity. The IUCN also assesses the threats acting on these factors. They may include the risks of predation or danger from other animals that have been introduced to the area in question through factors such as human activities. They are known as alien or invasive species and are viewed by the IUCN as the main threat to indigenous species. In addition, the IUCN cites the loss of a species’ natural habitat as a prominent extinction threat. This loss may occur as a result of encroaching agricultural, construction or industrial concerns, which can destroy or disrupt the ecosystems on which many species depend. Habitats may also be lost through climate change, pollution or other major upheavals in a given area. In addition, the numbers of many species in the wild are affected by the issue of human hunting or trapping. For example, humans may capture live animals to keep or sell as pets. In fact, this practice is still a massive global industry. In the case of the Spix’s macaw, the IUCN estimates that the birds’ numbers are failing in the wild due to the destruction of their habitat. This environment is known as “gallery woodland” containing the caraiba trees, in which the macaws prefer to nest, and the Euphorbiaceae-family plants on which they prefer to feed. Its recession is related to the spread of humans, their dwellings and infrastructure into the area (Rio São Francisco) in question. This includes the recent construction of a hydroelectric dam. The IUCN also makes a connection between trapping and the falling population of the birds, as alluded to in the 2011 movie. 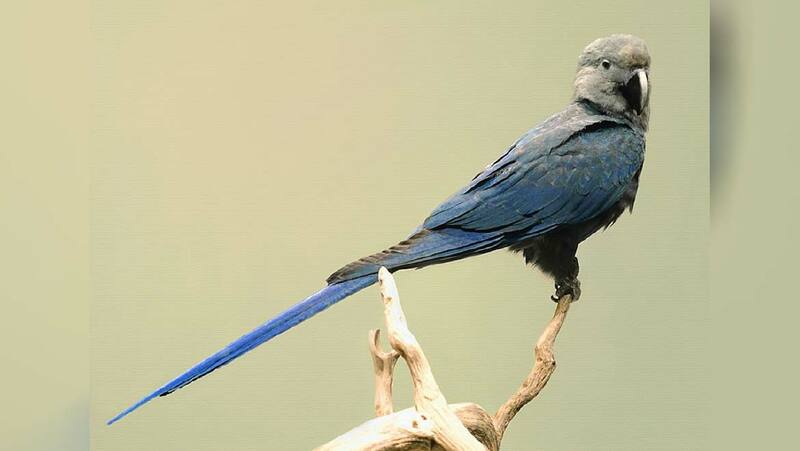 The decline of the Spix macaw is also partially linked to the ingress of aggressive African bees into the area. They also apparently colonize caraiba trees and are a potential hazard to the birds, if the two species cross paths. Thanks to these main factors, the ICUN asserts that there are now less than 50 adult Spix macaws left in the wild. The body also mentions that these remaining birds produced unviable eggs in the last few years. 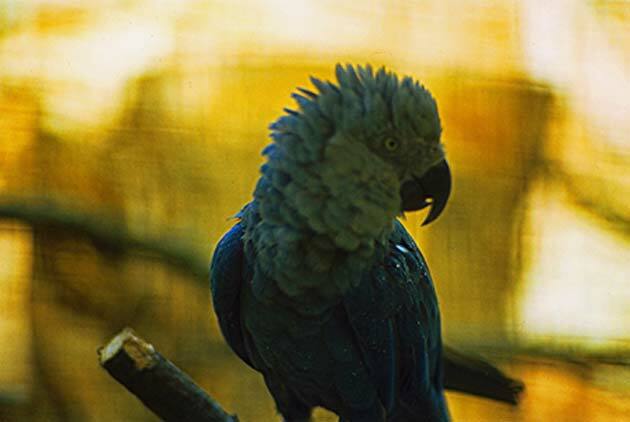 The IUCN currently ranks the Spix macaw as Critically Endangered, and also implies that the species is well on its way to the next rank, which is Extinct in the Wild. However, this criterion was set in 2016. A paper, to be published in the November 2018 edition of the journal Biological Conservation, suggests that this position should be re-evaluated. The scientists behind it, who work at BirdLife International (an organization based in the David Attenborough Building in Cambridge) and the Department of Zoology at the University of Cambridge, have compiled a new model to determine extinction in wild animals. The Cambridge researchers tested a range of new quantitative methods in this area, before selecting the best method to assign extinction-related rankings to different species. It involved assigning one probability value that takes factors such as threats, and a second one, based on species records and up-to-date species survey data, to each species. If both values fell below 0.5, the species would be listed as Critically Endangered or Possibly Extinct in the Wild, and if both fell below 0.1, however, it would be acknowledged as formally Extinct. The researchers reported that their new method had an 80% commonality with the IUCN Red List. However, in the case of much of the remaining 20%, it indicated that those species’ rankings should be adjusted. Specifically, the scientists recommended that nine of the species on the Red List – including the Spix’s macaw - should be finally declared Extinct or Possibly Extinct in the Wild. Other examples of apparently newly-extinct species are also birds. They include the Alagoas foliage-gleaner (Philydor novaesi), cryptic treehunter (Cichlocolaptes mazarbarnetti) and the poo-uli (Melamprosops phaeosoma). Should the BirdLife International/Cambridge team’s new model prove correct, this means that a new total of 187 species have become extinct since the year 1500. The team attributed most of the extinctions to trapping or hunting (26%). However, a majority of extinction events were associated with invasive species (46%), as per the paper. Currently, the number of Spix’s macaws are being boosted, artificially, through the existence of captive birds. However, this does not change the fact that they may now be absent in their native Brazilian forest habitats. On the other hand, both the IUCN ranking and the new Biological Conservation paper are based on data that is nearly two years old. There is still a (very slim) chance that the surveys and studies of the future will include new sightings of the distinctive bluebirds. S. H. M. Butchart, et al. (2018) Which bird species have gone extinct? A novel quantitative classification approach. Biological Conservation. 227: pp.9-18.